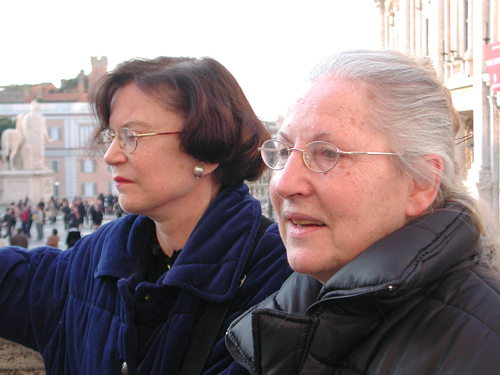 Lia Dequel and Silvia Viviani founded Torre Argentina in 1994. Lia lost her cruel battle with cancer on July 3, 2013 and left a big void in the hearts and lives of everyone who had come to love and respect her. Twenty years is a very long time within a normal life-span, especially when trying to recollect the many events that our far too feeble memory often eliminates, compresses or confuses. And when we recall them they are but a fleeting moment. Twenty years is the length of one’s journey from birth to adulthood. I met Lia twenty years ago. It was November of 93. I would even be able to pinpoint the very day were I compelled to leaf through my old papers. It was in fact the day I signed my retirement papers at what had been my workplace for thirty years. I felt free at last. A freedom which opened up a whole range of possibilities, and new decisions, for me. Then and there I did not want to venture anything life changing, or so I thought, nothing but a short stroll along the streets of old Rome. A very simple, trivial activity, and certainly with no significant consequences. It was about noon when I came to walk in front of the archaeological area of Torre Argentina, where, like every Roman citizen, I knew I would see some cats sunbathe or play with their fellow creatures. I did not know then that, along with cats, fate was also lying in wait, with the same mischievous little muzzle, crouching in a corner among the ruins, ready to pounce on me. Trying to locate the various cats among the ruins and tall grass I saw, in the midst of the archaeological area, two beautiful ladies looking very stylish and refined, who clearly were there for the cats: looking for them, caressing them and clearly speaking about them. I thought optimistically: well, then there is somebody who looks after these creatures, they are not left to themselves, perhaps an association that takes care of them. I approached the women, I tried to get their attention and pose my many questions. No, they were not members of an association. One of them, Franca, an actress, was the cat lady or gattara, of the neighborhood, who had organized shifts of sorts among herself and other cat-loving friends willing to spend an hour of their day feeding these creatures, cleaning the area, and drawing the necessary water at a street fountain located some blocks away. Easy, was it not? In fact, the monthly purchase of food for hundreds of cats is not a mere trifle that just anyone can afford. 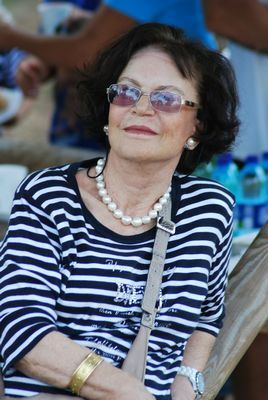 Franca was in great need of help because she was not always able to find sufficient money, many were the debts, not to mention the constant search for volunteers. The animals also needed medical treatment. There was, indeed, a wonderful veterinarian who had neutered all the cats for free throughout a whole year. This was the start of a tremendous change, but medicine needed to be bought. At the time all the medicine at their disposal could easily fit in a shoe box, and there were always new cats to be sterilized because, for Roman citizens, it was “traditional” to abandon their cats at Torre Argentina. They do not realize the evil they do. They unscrupulously think that where there are one hundred cats, one hundred and one can be accommodated just as easily. Just imagine somebody abandoning a non sterilized pair somewhere full of nooks and crannies, then imagine that the pair does its best to reproduce without being detected or captured, and voilà, just in a single year, at least twelve other cats have been added to the community. Furthermore, sterilization – we are talking about twenty years ago – was considered cruel, utterly unnatural, at best an expensive eccentricity. 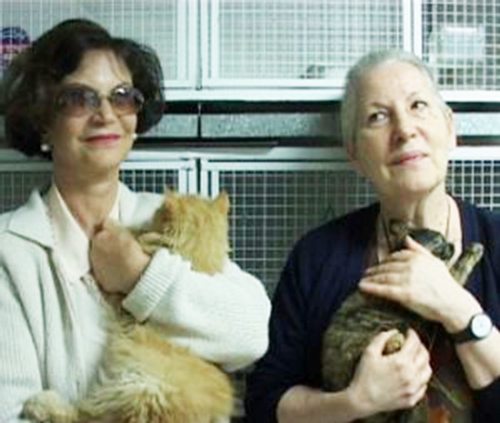 Very few, in Rome during the nineties, sterilized their house cats. Indeed, they were happy when their female gave birth because, of course, kittens were so cute, so sweet. The problem is that, when they reach two or three months of age nobody knows what to do with them. No problem. If you cannot (and generally you cannot) give them to friends and relatives, there is always Torre Argentina, where there are so many others already. Another place often designated for the disposal of unwanted cats was the Colosseum. But since the arcs which give access have been closed off with iron fences and only one passage left open – where tourists line up for hours in order to buy tickets – the monument was no longer accessible as a dumping ground for unwanted cats; Torre Argentina was and still affords far easier access.. In short, there are many problems related to cats, but few consider them as something to be taken seriously. After all they are only cats: strays moreover. People who take them to heart surely have nothing better to do, and are usually endowed with limited wisdom. If they are young, they must be mentally challenged, if older, well … at a certain age one becomes dimwitted … In any case they likely try to compensate for lack of affection, or even their own inability to feel affection for their fellow humans by feeding and taking care of cats. So surely, in a certain sense, providing them with new objects on which to shower their affection is for the best. The other lady was Lia. She passed daily by the area and often stopped to talk with Franca. 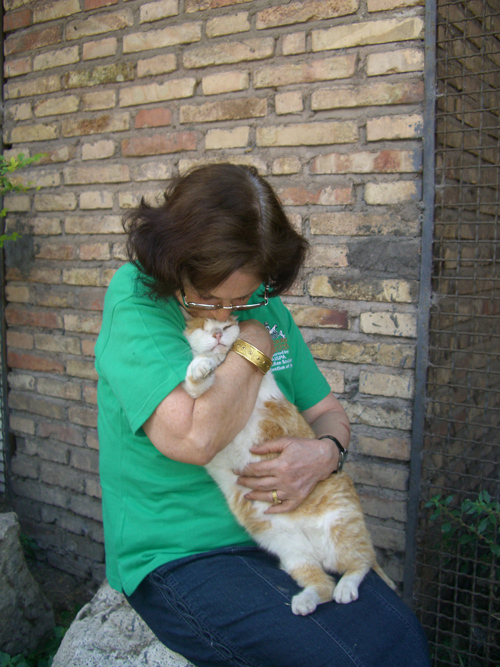 Not being able then to volunteer because of her commitments, often and willingly helped Franca financially to buy food for the cats. She told me, later, that she had never particularly loved cats until she met the man who would later become her husband, the sculptor Oreste Dequel. An exceptional man, full of life, humor, genius and small curious eccentricities typical of artistic temperaments which Lia, always poised and upright, had managed to channel … so that Oreste became more responsible, gratefully relying on her for all daily and practical tasks. Besides loving cats passionately for themselves, Oreste often made them the subject of his paintings and sculptures, much appreciated all over the world. Once married, their life and home was happily crowded with cats of all sizes and colors. When I met her she had been eight years a widow of the great love of her life, she felt closer to him when stroking cats and taking care of them. Since I showed interest in the cats, Lia, always practical and direct, unhesitatingly asked me the fatal question: would I be willing to volunteer a day of the week? There were not enough people to cover the busy schedule. Why not, I said, of course. By now I am free woman. I will come on Monday. At the end, I thought, this will be a limited, transient engagement, that will not affect my future plans, which are still not well defined. The following Monday I kept my appointment and found Lia already there. She always came on Mondays. She then confessed that she had not entertained much hope of seeing me, but were I to keep my word, she thought it better to come and keep me company as an encouragement … Wise and cautious, Lia was absolutely right. I confess that alone in that cold, dark and damp cave that besides cats was populated by cockroaches who used it as their hunting grounds, was not the best one could hope for in life. The horrible place was then far from being what it became a few years later: almost pleasant and even comfortable, all considered. One had to open and distribute the cans in the various feeding stations, all around the area, inside and out, to clean what could be cleaned and above all, fill the many canisters at the water fountain a block away. A burden one would have rather avoided, boring and tiring, had not it been for the poor animals. But with company like Lia’s, warm, happy, wise and intelligent, it weighed a lot less, in fact, it began to be pleasant. The commitment soon became weekly, then twice a week and a little later Lia also became fully operational, so to speak. We started pooling our savings to buy the necessary food, but soon we realized that we would go broke if we did not find another solution. You may read the details of our story and its developments elsewhere on this site, so I do not need to reiterate them. Meanwhile sympathy and mutual trust was fast growing . Our “ambition” increased. Combined forces do not simply add up: they multiply. Now we worked together tirelessly, every day. Already after two or three years, Torre Argentina took on, at least in part, what would be its present appearance. Lia spoke English quite well. Before she met the man who would become her husband, she had lived three years in the United States, where she had worked and learned the language. When she came back to Trieste in the late ’50s, her knowledge of English, then rather rare among young women, got her a job as a saleswoman on the beautiful cruise ships of a great Italian company. So it was that within a few years she managed to see a lot of the world. It was during one of these trips that she met Oreste. It was always so pleasant to hear her tell about this time of her life: so romantic. She herself was happy, even when sharing these memories with me. Then came marriage, the choice of Rome and Trastevere, at the time, and still today, the neighborhood preferred by artists from around the world. Then, the growing success of Oreste and then buying a house in Vence, an extremely picturesque village on the Côte d’Azur, where to spend summer together with an international community of friends, painters, and sculptors. It was in Vence that Lia showed her gift for learning languages picked up her French. Traveling around Europe and the United States, where Oreste was asked to give courses in sculpture or exhibitions of his works. In short, almost twenty years of happiness and satisfaction. Unfortunately, nothing is eternal in this world, let alone happiness. In 85 Oreste contracted a serious illness and passed away. It was just when, in his early sixties, on the threshold of an international reputation, he could have seized the fruits of his labor to make a name for himself and be acclaimed beyond the narrow circle of his chosen customers, experts, and art critics. That was definitely the most painful moment in Lia’s life. Not yet fifty, and still youthful and beautiful enough that those who did not know her addressed her as “Miss”. She would not even consider “starting life over” as they say. She chose solitude and austerity. She told me that just a few days after the death of Oreste, began to be treated as “Mrs”. Nothing had changed outwardly, she told me, but the pain had automatically performed the transition from “Miss” to “Mrs.” for those who saw her for the first time. Her youth began to wane with the death of Oreste. Yet she learned how to conquer depression and live her life with great dignity, modesty, submission and, of course, much less exciting than it had been with her husband. But Lia was one of the wisest women I’ve ever known and fully able to accept the setbacks of life. She had the very rare gift of appreciating what life offered, whether great or small. She knew how to accept her lot. She knew how to value what she had: the small satisfactions to be obtained day to day, and the small home in Trastevere she had shared alongside Oreste. And she was happy at Torre Argentina. She was happy to see it develop month after month, year after year. It was now her whole life, not merely a part of it. She was certain Oreste would have approved of what she did. For years we worked side by side, together with a wonderful company of volunteers that joined: a few at first, and then more and more. Only after much persuasion of these volunteers, who loved us, we yielded to their entreaties to rest one day a week and then two days a week. It was a concession to age, we were after all no longer young saplings. Everyone could not but recognize Lia’s energy, agility, strength, and capacity for work. She cared very much for her health. Some days of rest she would devote to analysis, tests, ultrasounds, and check ups. And she submitted to them with enthusiasm almost, and with the joy of being reassured by the positive outcomes. She felt healthy, strong, and free in body and lucid in mind. She could envision a retirement that was relaxed, dignified but still full of interests, in short, an exemplary old age  something, however, which she assumed to be very far off. She was always well-kept and elegant. But it is no secret, in fact I think she prided herself in letting it be known, that her elegance cost her very little. Every Sunday morning before coming to Torre Argentina,, her weekly diversion was to wander around the stands at Porta Portese, the Sunday flea market well known by Romans and foreigners alike. There you can find everything at incredibly low prices. Lia knew it well and knew where to go to find the right garments, often designer clothing, sometimes even originals, always elegant, to add to her wardrobe. And then she would have fun at our look of surprise when she would tell us the cost, in “her boutique”, of the that jacket of haute couture, that stupendous dress, or that surprising find for just a few Euro. Never more than five or six, more than that she considered “too expensive” and not worth picking up. Always guided by her common sense. She always maintained her slim figure and so with her new clothes she would always cut a great figure, as if she had come out of one of the great boutiques in Via dei Condotti or Via Borgognona. We also cannot forget, and she herself would not have let us, her forthright character, headstrong and not very diplomatic. That petite woman, elegant and fragile in appearance could instantly turn into a marine sergeant. Legendary at TA were her sudden entrances some mornings, like a cyclone, ready to take everyone to task, distributing orders left and right and a series of inspections, all of which were unsatisfactory or did not meet her criteria. Then, as the day wore on and things began to shape up according to her diktat she would begin to soften up, but woe to whomever would interrupt her while busy at her task … they risked being admonished in so sternly a manner that it frightened more than one new volunteer who would run away if he or she were too sensitive. These outbursts, however, the more weathered volunteers took them as one more medal earned in battle, and they turned out to be, in their own way, a form of selection and filter. Only the more alert and seriously motivated remained, those who understood how much kindness and generosity was hidden under that hard momentary shell was because she felt so strongly due to her love for cats, for everything had to be done well and in the right sequence. Later, in a moment of relax, everyone would get to see the sympathy and sense of humor of this generous and kind woman. So kind, perhaps, that she sometimes had to pretend to be made of iron. No one could help but be baffled whenever two seconds after a scolding, even when it was extremely harsh, she would turn to the victim with a sincere smile, and totally oblivious to the previous outburst which she would have completely forgotten … But all those who learned, perhaps at their expense, to know her better could not help but love her. And so she led her life with regularity. Taking care of cats occupied most of her time, along with her great passions; cinema (at least once a week) of which she was always up to date; and books, always reading, especially in English and French, so as to keep her knowledge fresh and up to date. Occasionally a visit to an exhibition as a tribute to her husband and very rarely a trip abroad for a few days. I can not stay away from Torre Argentina too much, she would say, returning perhaps two days ahead of schedule, and she would let us know, without mincing words, that she harbored no illusions about our ability  or lack thereof – especially yours truly, who has never been a practical person. Perhaps that was why we complemented each other very well, completely different, but definitely complementary..
Knowing how distracted and careless I was regarding everything practical, she would imagine that my being at the computer all day heavy socks would come handy in those early cold winters before we had heating, and so they would materialize. The same would happen with fingerless gloves, or whatever she happened to find at Porta Portese that could contribute to my well-being,: heavy dressing gowns, or insoles for my shoes. Sometimes she would bring items of clothing that she wanted me to wear, but that I would not since they were too colorful for my . Perhaps it was raining,Don’t you have an umbrella? Without a word to anyone she would go to the nearby Chinese shop and get me one. She would have wanted me to be always as elegant as she was. It was a constant struggle, and to her great disappointment, all for naught since at a certain moment in my life I had just decided not to worry about my appearance, something she could not tolerate … she would have preferred for me to keep my hair looking blond not white, and with makeup not without, but alas, I never gave her this satisfaction. I’m too lazy, I said, I’m too lazy to worry daily about my appearance. Sometimes she would glare in clear disapproval. In 98 I underwent a serious surgical operation after which I had a breakdown. I would have stayed at home had Lia not insisted, and she could be very convincing, that I stay at her place. She let me have her room for more than three months while she slept on a sofa.. No sister would have shown greater concern, patience and kindness. Something I can never forget. In the evening by eight o’clock, without fail, Lia was in bed, television on, book on the bedside table and with her cats curled up next to her, on top of her, near her head, or at her feet. I would phone, though never past ten which she considered already the middle of the night. We would talk about the events of the day, we would discuss problems that may have come up, discuss possible solutions, or maybe even simply to wish each other good night. I can still hear her voice, satisfied, relaxed, sometimes even joyful: I am in bed. cozy, with my cats. What more could I want? If she was not at home by eight thirty it meant that she was at the movies, there could be no doubt. Once however at 10 she did not answer the telephone, she should certainly have been at home by then, even if she had gone to the movies. Given the strict routine that Lia followed I began to be seriously worried, and I being a rather anxious person, after a moment’s hesitation, I called a taxi and rushed to her house to check up on her. I rang the intercom, no answer. I climbed up the stairs to her apartment and rang the doorbell. No sound from within. I called on the neighbors for help. Everyone now worried we began banging on the door with all our might, when suddenly the door opened, Lia in her nightgown, sleepy and astonished by this rude awakening. The simple truth is that sometimes Lia’s sleep of the just is so justified that she had heard neither phone, nor doorbell, neither intercom nor banging. The phone, in all likelihood, was covered by a blanket, or even by a cat that made itself comfortable on it, and so the sound had been muffled. Lia realized that she could not escape the zeal of her anxious friends and in order to prevent further surprises she would update me on her evening’s programs and would call once she arrived home. Who would have thought that this simple, modest and austere routine which none but an unkind fate would have broken and overturned in the most cruel fashion in only a matter of two or three weeks. As it was, one of her traits was to be free of anxiety. She would never consider the worst, save when the worst would overwhelm her in all its brute force, in which case she would face it rationally and with courage. So now we come to that terrible afternoon in which she was called to the hospital and was asked to come accompanied by two relatives. There were none so Carla and I went with her. Shocked and distraught we listened to the verdict. A thunderbolt that suddenly annihilated everything. Three months left, maybe even less. One last shred of hope, whose outcome would be uncertain, a very difficult operation which may perhaps give her three or even four years of bearable life. Lia was inscrutable. She listened silently, her face pinched , I have already thought it over . There isn’t much of a choice. Please operate. Courage and take heart, doctor. I will always remember those words spoken by Lia. Two days later she was whisked away to the operating room, she smiled and hugged us before going inside. We were optimistic. Lia is strong, she will beat the odds. We waited eight hours. The operation went well, the surgeon was positive and happy. But she was supposed to wake up half an hour later, an hour went by, then two, then the whole night. Then came another verdict, during or perhaps after the operation there was a massive cerebral ischemia. From February 14th until July 3rd, the day she passed away, Lia no longer spoke, could not move her left side of her body, and could not swallow anything. But she could hear and understand everything.. She would answer yes or no by closing her right hand or closing her eyes, the only movements she could manage. We were happy at first that she realized she had survived the operation, and we managed for a while to let her believe things would be fine in time. But we soon realized we could not fool her. She was too bright not to understand the truth that had crushed her without pity. She could not accept this betrayal by her own organism, so thoroughly checked and tested and cared for. This ferocious irony that struck an organ that had always been the healthiest, so much so that it was always low in the priorities of her exams. And she could not talk, she could not ask, she could not even complain. We would see the desperate questioning with her eyes, and we could not answer except with horrible pitiful lies. She was without her cats and had no family to assist her. It was our privilege to be close to her until the last. One of our Dutch-Italian volunteers gave her unlimited time selflessly to try and obtain the best possible assistance in the best hospitals in Rome, always in the hope that given her strong fiber Lia could be saved and somehow recover. Her suffering, maybe not long as that of others, were nonetheless dreadful and perhaps more moral than physical. Lia now rests in peace in her cemetery in Trieste, the same tomb as Oreste. It was her expressed wish that the tomb says Let cats come and play around our tomb. We have loved them so much while we were alive. There are naturally cats in Saint Anne’s Cemetery who substitute the ones at Torre Argentina. For believers Lia died in peace with God and is praying for us and for Torre Argentina. Those who can and wish to may pray for her and Oreste. It would be for our good, in life and in death: different aspects of life. And, as Lia would say: Courage and take heart.